This series is inspired by “Project Management Basics” by Melanie McBride. Starting projects can be overwhelming . Where should you start is much harder when you have no project management knowledge. You can waste much time on work that isn’t valuable in this phase. Getting Started and taking the right steps in the beginning is so important. That’s what we are going to talk about. As we mentioned in the previous post, The Initiating Phase is when project objectives and constraints are identified and they usually identified by a process called scoping. In Scoping activity, high-level schedule, budget, deliverables, and resources are identified. Scoping is different from planning. It focuses on the big chunks of work instead of nailing down the specific project requirements. Scoping activity is gathering a group of subject matter experts to evaluate the opportunity that is your project and come up with high-level estimates for what’s needed to execute the project and a timeline. Scoping is a big picture of the project and it tells you what is inside and what is outside the box (Project Boundaries). The First Step (Scoping) is to define project Objectives, You can do so by asking stakeholders what they think is the purpose of this project and what should the team deliver at the end. You should ask anyone who can provide you with these information. Try to ask as many questions as possible in order to make project objectives clear. Clear Objectives lead to clear work path without distraction by stakeholders referring some difference between their expectations and the results. You should at last be able to state the objective in two sentences. Now comes the time of creating stakeholders List. It should include all people who care about your project, customers, partners and every player in the game. This list should also include their role in the project and what they care about in the project. This list represents the Major stakeholders. Once the list is ready, start discussing the objectives with them and what they expect as a success criteria. In this stage, you need to confirm your understanding for the objectives. You will use this list later during the planning phase in order to develop a communication plan. There’s another shortlist that includes decision-makers and budget owners. Now comes the time of figuring out the the High-Level Project Constraints (The Triple Constraints). It represents the relationship between the schedule, scope and resources. This relation should always be maintained. 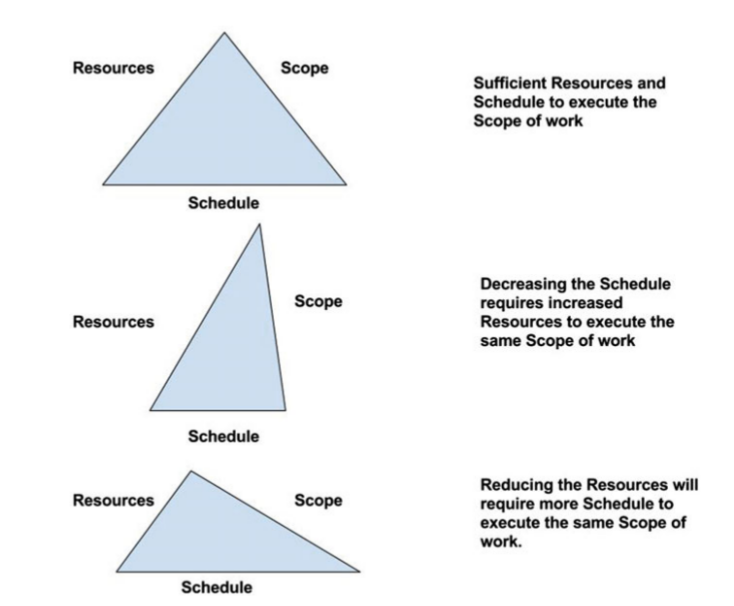 Let’s say if the schedule value changed then scope and resources should be maintained in the same manner to keep the relation stable. This relation can be represented in a triangle as in the following figure. In your meeting with the major stakeholders, and beside project objectives, you have to explain each of the Triple Constraints. Let’s talk more about them. The High-Level Schedule, The most important date that you have always put on front of you is the end date and any deliverable date. These dates are what all stakeholders remember more than any other date, even if it was realistic or not. You can negotiate it later in the planning phase. Don’t forget to discuss the interim deliverables with your stakeholders, there are some commitment that may be made for a client like mock-ups, sample output, test results etc.. These deliverables dates will be fed in your planning process, so you have to discuss them early. Always WAIT until you do some planning and analysis before negotiating any date or budget. All eyes will be watching the next scheduled date because negotiating for the second time will be considered as a dereliction in the project manager job. Negotiating after planning help you come up with alternatives with it’s business impact based on data. Don’t make your decisions and actions based on hysterical voices in your head. The High-Level Scope of Work. In the meeting, you have to focus on the big pieces of functionality in your project. They will turnout to be the most important deliverables from your stakeholders prescriptive. Spend sometime talking about how each stakeholder think about project deliverables and what aspects of the project are important to each stakeholder. This step is just the beginning of gathering the requirements. Be aware that your stakeholders may specify some technologies, software applications etc.. as part of the scope, just smile and ignore that your scope is what you are going to deliver and let your team evaluate these notes later in the planning phase. The High-Level Resources. Don’t negotiate with stakeholders about project budget. In this phase you are collecting as much data as possible. Stakeholders always try not to be generous in this phase, so collect their expectation and negotiate with them later in planning phase once you figure out requirements and execution strategy. Not all the budget is located in the same bucket. You have to review the previous projects in of the company you are working for in order to understand from where the spends came from. Like if you will need an employee to travel to show a demo to a client, may the cost of travel come from program, project budget or sales budget. Team size and location are also important factors that you will need later in planning phase to set a precise budget. So don’t forget to discuss them with stakeholders. You should also ask about the number of team members if they have already defined a team. If not, then you got an opportunity to highlight the most important skills you need in the project and highlight the potential team members that you don’t want them to be in. Now, you are ready to build a project charter. Project charter should contain all the information that you have gathered from the scoping activity. Project charters are usually used by two contradictory mindsets. The first mindset believes that Project Charter solely owned by project sponsors and it specifically authorize the project manager to utilize resources to execute the project. This mindset is represented in the Project Management Institute (PMI). The other mindset represents the author mindset and many other project managers who create a project charter as a routine work. However, they rarely use it later through the other phases. As a project manager It’s rarely to get handed a project charter when you join a project and if you got handed one, you will still have to validate these data, so you will re do all the job of Initiating face one more time from the beginning. Now you are ready to hold your kickoff meeting. This meeting is considered as the first official meeting and the launching point from the perspective of stakeholders. In this meeting you will discuss project constraints, deadlines, challenges, innovation and ingenuity fields. Now, we reached the end of this phase, to wrap up this phase, here’s a checklist for all tasks you have to do. Congrats, You finally made it. It’s not that hard, right?? Now, Let’s move now to the next phase “The Planning Phase”. 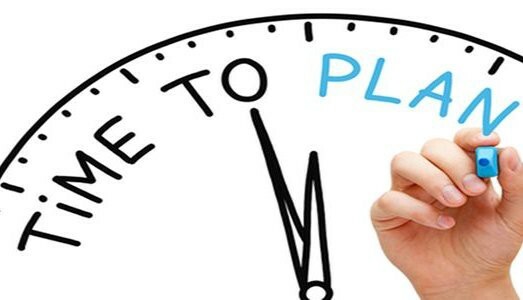 Our next post will be about the planning phase and what tasks you should complete in this phase, and we will wrap up at the end with a checklist of all tasks. Project Management Basics | Initiating Phase was originally published in xWARE Integrated Solutions on Medium, where people are continuing the conversation by highlighting and responding to this story.